I picked this little guy up in Japan last month and had it shipped to me. Just got it today. 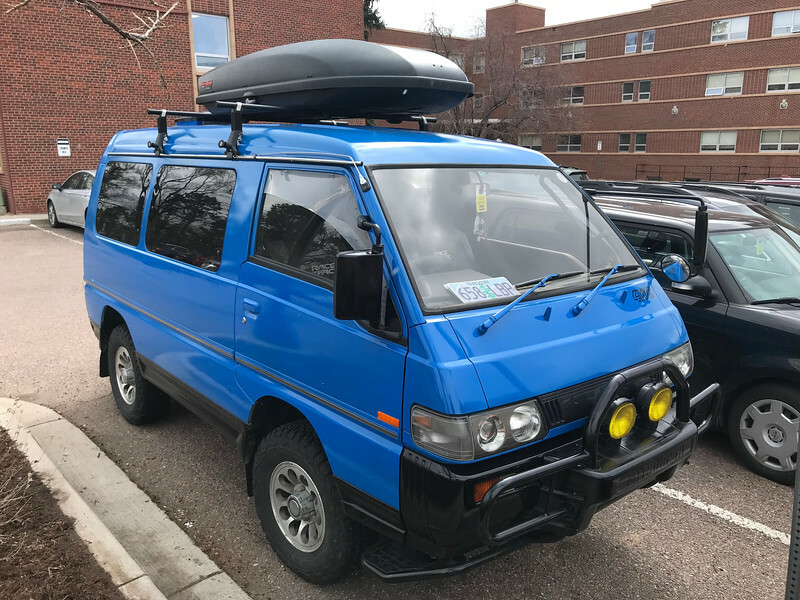 Its a Mitsubishi Delica swb 4x4. I have big plans for it. I'm going to turn it into an expedition vehicle for a trip I have coming up in April. I think it's a good basis for one. Did some fairly decent offroading with it today and it did fantastic. The turbo diesel puts out gobs of torque and with 4wd it just plows through everything. Already have bigger tires and upgraded suspension ordered for it. Looking into roof top tents and a solar system to help me out in the wild. I have a kitchen unit from camping that I am going to put in it. I'm told it can fit 2 full size dirty bikes in the back on a sliding rail system that people have made for them. Should be epic. I may do a build thread on it. Re: My new fun bus! Just curious about shipping costs from Japan? My step son is work on turning a E350 van into a 4x4 off road camper and this looks like something he would be interested in. Depends on a lot but probably $2k or less. Lots of little things really start adding up. Did you ship that into massachusetts or europe? I'd be interested to follow a build thread for sure, that's a cool looking van. I'm thinking of importing something from Japan in the next year or two. I'd love to read a breakdown of the costs/hassle if you have time to write one up! I'd get an old Nissan Pulsar GTi-R or an early Mitsubishi EVO Lancer. Buy an evo now. Prices are rocketing up. What i paid for last year at 3k is now 6k. Crazy jumps. Gti-r is no longer a reasonably priced car. Well above 12k now. Supra twin turbo is cheaper and easier to find. Shipping and buying is fairly easy if you have help. So many hidden little costs. Its like closing on a house, you really dont know what it costs until your picking up the keys at the port. Most normal vehicles like skylines and supras tend to be around $1700 or so shipped to the east cost. Trucks get pricey quickly due to the chicken tax. I brought it to europe but its nearly the same for the US. Theoretically easier if you want to ship to L.A. instead of new york or boston. Hopefully i can get around to doing a build thread. Time is not on my side right now though. I only have a few weekends to get things ordered and done before i leave in April. That trip will be down to south africa-ish. If it does well then iceland and the scandanavian countries would be next some time towards the end of summer. I suppose i could do it after the fact while we are traveling which i hadnt thought of. Not so much of a build update but a trip one? I didn't go crazy on the build because I didnt really know what I wanted. This trip is its first shake down run and we will see how it goes. I removed the rear jumper seats to give us more room. I left the infinitely adjustable middle seats in so my pug could use them as a bed/viewing perch. I have a 100w solar panel on the roof but it's not going to stay there. I really wanted to mount a safari rack and put it on that but decided against it for now due to all the low overhead heights of those little European villages we are going to cut through. The van sits just under 6ft 6in which about the average height restriction here. My next trip will certainly have the cargo rack mounted with the solar panel on that. I build a small battery box with a 110a/h battery to power my fridge and air bed. I have a small kitchen in the back now with a single burner stove and cupboard. No sink but I have this little wash basin and I am carrying 10g allons of fresh water. I opted to bring a tent with us for now instead of living out of the van. My wife wasnt crazy about that so to avoid the fight I agreed to a tent. At some point in the trip I will try to move inside the van. Just a couple pics of it going on the ferry to Spain last night. It's a 3 day trip to cross as the ship is stopping at a few islands along way to restock. Once we hit Spain we are heading to pamplona for a while then heading east towards the Mediterranean and follow the coastal routes to get us closer to the mount Blanc tunnel. After that I'm not sure yet. Wife really wants to go to Switzerland so that's probably where we will end up. We were in Colorado Springs last week and saw this one. Oregon plate. If I realized you had one would have taken some inside pics but it appears stock. The early 90’s models have not hit the 25 year threshold for import. Last edited by Garandman; 04-15-19 at 06:31 AM. What do you have for a power plant? Is yours 4WD? I have the l400. 2.8td, 4wd, centre locking diffs automatic. It's a beast. Cant get it stuck. My test drive was trying to getting it stuck under the white cliffs of Dover and it didnt fail. I'm glad I at least got a turbo. I didnt realise the elevation changes I would be doing. I am heading to Andorra, a country I never knew about, and it's quite high up. Just getting off the ferry in Bilbao and getting out of the area would have been a challenge for a lesser vehicle. Most motor homes I passed were doing 40mph and really struggling. The little deli is fine at 70mph up all those mountain passes. 2.8 turbodiesel should get great mpg as well. 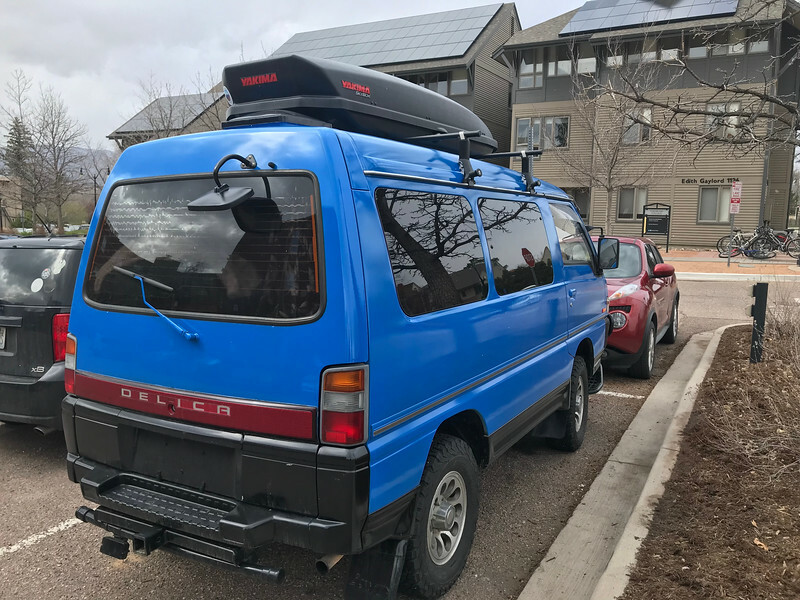 I saw one of these in front of my friends house in LA immediately after spending several days in Death Valley "off-roading" in my van and fell in love with it. Hope you love it all the same, it is such a rad little van. Filling up someplace near San sebastian. These mountain roads are crazy. Maybe a little too much for this thing now. The inclines are so steep and they just keep going up and up.